Here's another one of the anniversary Buddhas. He has found a home on my desk at work. This is another Meditating Buddha holding the begging bowl. I'm hell bent on finding a good resource on the meaning and significance of all these Buddha's and will share as soon as I do. He is sitting on the book, Five Good Minutes at Work - 100 Mindful Practices to Help You Relieve Stress and Bring Your Best to Work. 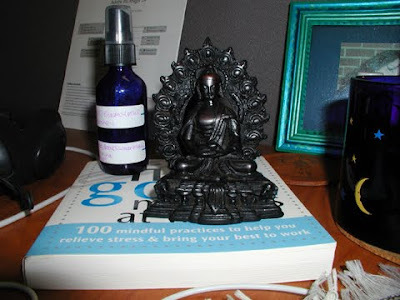 Next to him is some aromatherapy spray I mixed for clearing the head, boosting concentration, stimulating the mind and alerting the senses, made up of peppermint, eucalyptus and rosemary. The work related stress that I get is more from having a lot of projects and becoming overwhelmed and not knowing where to start, thus becoming paralyzed. Which leads to procrastination, which leads to more stress. Often thrown in is the disaster that my desk becomes. Clutter just makes it all worse. So, hopefully, having some sacred space on my desk with Buddha there will help with this. My goal is to clear off my desk at the end of the day so that it stays clean. It's been clean since office clean up day on Nov 6! Right now the sacred space is next to my computer but I'm getting a new computer so that may have to change. Uh oh, there's that "C" word again! !